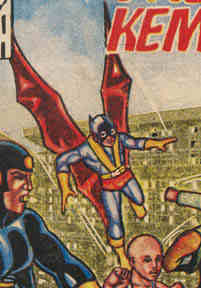 Powers/Abilities: Able to fly (like a flying fox, so might be just gliding). Able to speak to animals and command them. History: While hunting in the woods with his father, Agus Supriyadi became lost. He was helped by a herd of flying fox, the king of whom gave him the powers of a flying fox and named him Kalong.